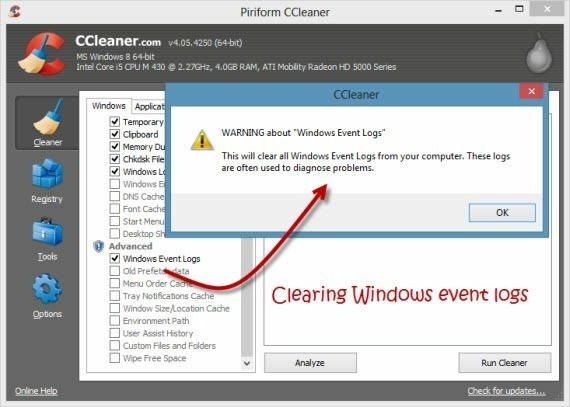 The latest version of CCleaner 4.05 includes a new cleaning feature which now cleans the Windows Event logs. Windows Event logs are advanced logs which record information about different functions of the system. We can see the information in event logs through the Event Viewer. More details about the event viewer here. You can start the Event Viewer by running eventvwr.msc or Windows Key + X + V shortcut key if you are using Windows 8. The new CCleaner asks the user about persistent cookies when installed for the first time. It is called Intelligent Cookies Scan. This will help CCleaner keep the cookies which are used by services like Microsoft, Google, Yahoo for their services like Outlook.com, Gmail.com and Yahoo mail. While CCleaner can clean most types of crap and junk files from the system, now it includes the capability of automatically deleting the event logs. If you do not monitor and see the event logs, you can delete them safely to keep your system clean. After you have installed CCleaner, under Windows tab –> Advanced, select “Windows Event Logs”. This will open the warning dialog telling you that checking this option will clear the Windows event logs. Press the OK button and proceed with Run Cleaner. This will clean the junk files from the system along with the Windows event logs. Do you use Event logs for monitoring your system? What was the last time you checked your event logs?